Buried in a foot-square box, weighing as little as a textbook, are four black, palm size pods; two identical power supplies and two gently curved gadgets with tiny ports and silver switches. The switches are no bigger than the tip of a ballpoint pen. These are first such components I've reviewed for Enjoy the Music.com. I have left the world of engine-block tube amplifiers; I am in the land of Gulliver . In electronics, a digital-to-analog converter (DAC) converts the binary ones and zeroes of a digital signal into the analog sound waves of music (current, voltage or electric charge). This means it takes the music from my computer and massages it into a signal for the headphone amplifier. For speakers the size of Lilliputians, the HeadRoom Micro DAC massages the sound for the Micro amplifier. How well they do this determines how good they sound. The rubber ridges of the end plates on each Micro indent so that the two units snuggle adorably together in a stack no taller than a finger. At first, I thought I would position the pair under my desk, but the switches and labels are so small — and used so frequently — I quickly tucked them beside my monitor. HeadRoom dominates the airwaves for Internet sales of headphones and amplifier. Their pages, reviews and ads are everywhere. HeadRoom Vice-president of Sales & Marketing is Ivy Burford. She included a bundle of short wires. Such thoughtfulness is not typical amongst vendors asking you to review their equipment and was a big help when swapping equipment. Though I have a mess of wires, I needed the ones she sent. Neither unit normally includes cables, but HeadRoom has all the connections you need, including USB, optical, coax, mini-to-mini and Toslink-optical mini adaptors. You do need an optical, coaxial, or USB output to use the Micro DAC. A headphone jack is an analog output, so the Micro DAC does not work directly with CD and iPod players. There is no sonic difference between the older USB and the much faster USB 2.0 ports. In the dark dungeon under my desk, the light of a cell phone comes in handy to make the connections. To hook the Micro DAC to the Micro Amp, you need a 6-inch mini 1/8 to 1/8 interconnect. The charming pair come with excellent manuals: a dozen half-size informative pages with colorful pictures, diagrams and a happy attitude. The graphics make hook up easy. Before you buy any head thing, amplifier or cans, from anybody, be sure to check out HeadRoom's How to Interpret Headphone Data page. It is quite useful. But, Burford says, there is no precise formula for matching headphones and their amplifiers. Basically, she said, a high impedance and/or a low sensitivity headphone rating indicates the need for an amplifier to obtain quality sound. What is "high impedance"? Anything over, Burford relayed from HeadRoom's engineer, "60 Ohms or so could be considered "high" — but there are still 32 Ohm headphones that need an amplifier, or 64 Ohm [models] that do not. Notice, however, I did not say 250 Ohm headphone not needing an amplifier, which could likely never be the case, no matter how sensitive." In addition to high and wild impedance curves, just like full size speakers, the sensitivity of headphones affects amplifier matching. Cans with higher sensitivities such as mine (102dB/mW at 1 kHz) may not obviously need a amplifier. Yet, because they are easier for the amplifier to drive, such high efficiency makes the improvements with an amplifier more noticeable. Burford warned, "Headphones are also affected by things such as the size and weight of the magnet, or the type of cable... so there are times you may have low impedance, high sensitivity headphones that still benefit strongly from an amplifier. Scale in the land of headphone amplifiers is so much smaller that citizens there don't even rate amplifier power by wattage. Power output of their Lilliputian headphone amplifiers, Burford says, "is load dependent, but can be anywhere from 16 to 600 Ohm impedance. There are essentially no headphones out there with impedance higher than 600 Ohms, so this amp will drive any pair of headphones with ease." Despite all this, Burford said "there's no matching necessary for the vast majority of headphones and solid state amps. The amplifier output impedance is much, much lower than the headphone impedance, giving a pretty sizable damping factor." Yet, as I found out with Antique Sound Laboratory's HB-1 Hybrid Headphone Amplifier, she was right when she added, "tube amps are a bit different though." More on this later. HeadRoom does something all speakers manufacturers should do. They provide a useful Build a Chart page for the headphones they sell (see Impedance Versus Frequency). Even with a relatively flat 64-ohm impedance curve and high sensitivity of 102dB, Burford thought my Audio-Technica ATH-A700 miniature ear speakers "certainly require an amp." The only nit I had to pick with my headphones was they didn't "feel as live as a full-size speaker does." Therefore, Burford said the question for me "is not whether the amp will drive them, again, any headphone amp should provide plenty of power. Because your headphones are quite efficient, the bigger question is assessing performance with, versus without, an amp." I should, she said, "find a noticeable improvement doing this kind of comparison..."
Their demo units did not need any break-in, though I've heard a few solid-state pieces that do sound better after warm-up. Breaking in their Micro amplifier, Burford said, "is not as warranted as it is with some headphones. Certain headphones are much more dependent on break-in than other models," she says, "the AKG K701 are famous for needing a lot of burn in time (up to 300 hours)." The tiny Micro amplifier is DC-coupled (meaning no capacitors in the signal path). The left and right channels are completely separate, back to the power supply and separately decoupled as well. The amplifier uses Texas Instruments OPA134 chip, making it more like the Trends chip amplifier than the tube beasts I reviewed lately. HeadRoom says their resistors are "truly extraordinary audio quality." Active stages, except the gain stage, are true Class A. The gain stage is Class A/B topology. In the HeadRoom Micro DAC, a Cirrus Logic CS4398 chip provides a very wide 120dB dynamic range and a very low -107dB THD+Noise figure. Plug everything together, plug in the cans, check to make sure volume is off, select USB input on the DAC, switch to input One on the amplifier, double-check Volume to make sure that a sudden surge of power doesn't damage my precious cans, flick Power switches on and the first impression is startling. The HeadRoom Micro combo is eminently listenable. Jimmie One: The bass has impact, feels as solid as if there is a subwoofer under the desk. There is sizzle to the treble. Fire up Led Zeppelin II (1969, 12 million copies sold to date), a 1.4 Mbps wav file with Windows Media Player. The opening riffs grab me with their rasp and the piece comes alive with a "Whole Lotta Love." The breathing energy I previously sought with higher and higher volume is easily found with the Micro combo at a mere quarter turn of the dial. As with most quality components, the Micro pair make the musicians work seem effortless and smooth. There is power aplenty here; it is easy to overwhelm the cans. The volume knob on the Micro amplifier is an uncolored notch. Twelve o'clock on the dial is painfully LOUD. I suspect the Micro pair are a dangerous combination in the hands of a teenager. Burford says, "the amps can be loud. But, this is a big but, it depends on the headphones. Plug a pair of very demanding Sennheiser HD650's in there (300 ohm impedance) and you would be surprised at the dB change." The Micro amplifier includes HeadRoom's own Crossfeed circuit to improve headphone imaging. Pop the little silver switch up and down and you can immediately tell the difference. The change is not huge, but the Crossfeed circuit adds a tinge of air, like a larger hall behind the vocals. Although it is a smart marketing move to make the Crossfeed a switchable feature - so you can hear the affect - once you appreciate what it does, you will probably leave it on all the time. The effect seemed greater than the phase test on my Reference discs. Assessing performance with and without the combo is easy. As Burford said, I did indeed "find a noticeable improvement." In fact, I would not want to listen to headphones on a PC without this wonderful combo. Did it feel live? No, but it made me feel as if I was at the recording session. It made me feel as fell I was getting all of the music, that I wasn't missing anything. Jimmie Two: No better example of the sonic difference between "haves and haves not" of headphone amplifiers exists than the bass on Diana Krall's "Jimmie" (Stepping Out, also1.4 Mbps wav file). Without amplification, you may not realize you are missing something, but add an amplifier and women should beware. The slow, growling draw of the bow across the strings becomes deliciously sensuous and decadently enticing. Bass is full and tight without obvious bloat or boom. Midrange is clear and clean. Treble is crisp, without too much sparkle. Unlike ultra-efficient horns or delicate SET tube amplifiers, I could not tell if the Micro combo's Class A topology made a difference. Nor did separate channel construction make itself clearly evident. Compared to my cans on the HeadRoom combo, my $20 Sony ear buds are lightweight boom boxes. The buds are watery grape juice unsuitable for toasting to "Aud Lang Syne." I stuffed them away like "auld acquaintance [that should] be forgot." I also compared the charming HeadRoom combo to Benchmark's awesome DAC1USB ($1295) and ASL's $300 tube HB-1, and will have separate reviews of those units shortly. The DAC1USB is twice the size and 50 percent more debit than the HeadRoom combo. Flawless sonic quality makes it a serious piece of ultimate audio gear. Four times larger than the HeadRoom combo, but less than half the combo price, the ASL HB1 tube amplifier is barely a micro amplifier for miniature ear speakers. There is much to love and almost nothing to hate about all three. For example, both the DAC1USB and the Micro combo captured the deep groin stimulation of the bass line in "Jimmie." Although enticing in other areas, the HB1 did not. The ASL tube amplifier sounds, as you might guess, quite differently than the other two solid-state units. Like most tube amplifiers, the HB1 capabilities are more like a smooth Omega single driver, than the wide competency of a three-way speaker. The HeadRoom combo meanwhile, provides most of the DAC1USB's Über pie, but for a lot less dough. They provide 75 to 90 percent of the sound quality at a good, solid price. The treble sparkles, horns blat and blare. 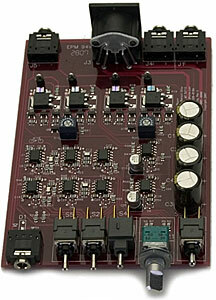 The amplifier allows two inputs and three gain settings. It is small, attractive and competently designed, with great sound. Think 300-hp Mustang versus seven liter Vette, at twice the price. I did not review HeadRoom's Portable Micro Amplifier, but the combo's small size invites portable use. For ultimate convenience on the go, investigate their Portable Micro Amplifier with its internal DAC option. If my Red Wine Clari T is any guide, battery powered amplifiers can sound just as good, if not better than AC powered ones. An international-use Astrodyne Power Supply is also available. All HeadRoom Micro DAC and amplifiers are hand-built in Montana, USA. HeadRoom has a "huge wall of headphones and our amplifiers in the sales office, and we welcome people by appointment. But because we're in Bozeman , Montana , we get 99.9 percent of our business by website or phone. We'd love," Burford says for people to "come for a visit, though, if you're ever in the neighborhood!" Three Blue Notes means that the unit's performance in this category is average, with no serious weaknesses; compared to other units I auditioned for Enjoy the Music.com. Thus, the Micro combo wins four Blue Notes for above average Tonality. The Crossfeed feature edges them over the mid-line in the Imaging category. While Japanese quality Fit & Finish is also above average. Although the price of the HeadRoom combo seems high compared to the price of the headphones, the ratio is relatively close to what full size speakers and front-end electronics cost. It is common, and well-worth it, to spend five times, or more, on front-end electronics than the price of the speakers. The price of the HeadRoom combo is not too great an investment for music lovers chained to their desks. There is a reason HeadRoom dominates the airwaves. These guys know their headphones and amplifiers. You can trust their recommendations. Because of their small size, good looks, unique design, thoughtful features, Crossfeed circuit, sonic competence, dynamic range and low THD, I give the Micro combo four Blue Notes for Value. More importantly, in my own personal category, Enjoyment, the HeadRoom combo easily scores four Blue Notes. No, they are not bi-powered horns sending me into orbits of ecstasy, but they are smoothly and effortless competent at making music come alive. For me, at work in my gray rabbit warren of cubicles, that joy is priceless.